Sucked into a portal through another dimension, Zita must rescue her friend and find a way home before the world she is on is destroyed. Oh, but it's so much more fun then all that! Winner of this year's Cybil Award for Best Middle Grade Graphic Novel. Zita lands in a parallel world where the inhabitants are either trying to escape or prepare for the destruction of the planet within three days. 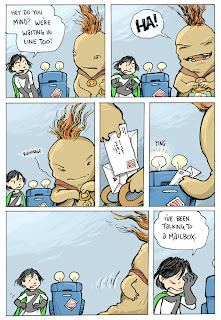 The clock is ticking, Zita has to find her friend then find her way home, but not without a sci-fi heroes journey that includes magicians, robots, giant rats, and some monstery looking aliens, all of varying temperaments and trustworthiness. in the end when all the threads come together it looks like either Zita or Joseph can return through the portal but not both. Adventurous Zita understand that if one of them is likely to find an alternate way home it will be her, and with that resolved and a small band of new friends Zita is poised to begin a series of new adventures. Zita the Spacegirl is, honestly, the most satisfying middle grade graphic novel in the past year. I might not have read everything, and I might be forgetting something along the way that could have held its own against Zita, but if anything else was that good you'd think I'd remember. Is it Shakespeare? Heck nah. Is it fun? Yup. Perhaps not at the same level as Jeff Smith's Bone series, but in that general ballpark in terms of visual fluency and story pacing. If Hatke can manage to tease a mythology out of this parallel world and give Zita a sense of destiny and depth then I'll be really excited to see how the story plays out in future editions. 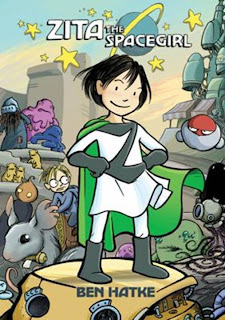 Of the other finalists in the Cybils graphic novel category Zita the Spacegirl was the best paced, most engaging, and free of the problems that sank its co-nominees. From my perspective Dan Santant's Sidekicks felt slight (and sadly predictable) by comparison, Selznick's Wonderstruck and the collection Nursery Rhyme Comics both suffered from inappropriate categorization that might have made them winners elsewhere (middle grade fiction on the former, picture book for the latter), and Barry Deutsch's Hereville includes some unique problems that deserves a review all its own. Something that came up when the judges were deciding on how to word this selection for the Cybils was whether or not to mention the book's boy-friendliness. I was against saying anything official for the award because it wasn't really a criteria for discussion nor was it a deciding factor. While I do believe that there are things writers can do to make books more boy-friendly I am also firmly in the camp that believes boys can, and should, be encouraged to read everything no mater the gender of the main character. Some books, like Zita the Spacegirl, make this an easier proposition however.